Day 1: Board in Taormina, Sicily, the largest island in Italy. Relax on board. Perhaps in the afternoon head out by yacht to anchor off the beaches close by returning in the evening to explore Taormina, a pleasing combination of Greek architecture mixed in with medieval architecture, Taormina is considered the top resort town of Sicily. Visit the Greek Amphitheatre built in 300 BC for an excellent view of the Straits of Messina with Mount Etna towering in the background. Still used as a theatre, you may be in Taormina when a play is being performed in the ancient amphitheater, perhaps in accompaniment to puffs from nearby Mount Etna. Wander the little medieval streets, where around every corner may be a piazza or a secret walled garden. At night Taormina comes alive, with street cafes, restaurants, and shops still open adding to the festive feel. Overnight. Day 2: For those that want, a morning jaunt can be arranged to see Mount Etna up close. Others can shop in Taormina, which is filled with upscale shops and boutiques. After lunch cruise to Stomboli Island, in the Aeolian Islands, to dine on the top deck in the light of the constantly erupting volcano. After dinner for a safe anchorage head to the nearby Aeolian Island of Panarea. Day 3: Panerea is tiny compared to the other islands but picturesque with its stark white houses and brilliant yellow genestra bushes. 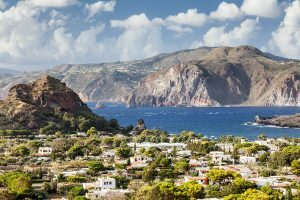 Considered the “San Tropez” of the Aeolian Islands, however on a much smaller scale, Panarea is the chicest of the Aeolian Islands and attracts a more jet set crowd than the other islands. Again, as part of a UNESCO World Heritage Site, building on this island is strictly controlled. Hidden on this island are the villas of Royalty and the very wealthy often reachable only by a walking path. On shore, visit the thermal springs near the village of Punta di Peppe e Maria, and off shore, swim to the shipwreck between the rocks of Lisca Bianca and Bottaro. There are no roads on the island and no street lights. Those in search of night life rely on their own two feet and a torch or lantern for what night life there is other than impromptu dinners at neighbor’s houses. The chic dinner location at around 10:00pm is The Bridge Sushi Bar. And after it is off to the Raya Hotel for the nightly dance party on the terrace with a view of the constant eruptions of the volcano on nearby Stromboli Island, certainly a unique, one of a kind, night club light show. Enjoy spending time around this lovely island visited only by those in the know. Day trips for swimming and exploring are possible to visit the islands of Salina and Lipari. Very early in the am cruise during the night to the island of Capri. Day 4: Wake up in Capri, which overlooks the stunning Bay of Naples and Mount Vesuvius. Capri has always been one of the favorite resting places for the privileged. Once home to the Roman Emperor Tiberius, Capri now serves as the perfect getaway in which to experience Italy’s natural, scenic beauty. 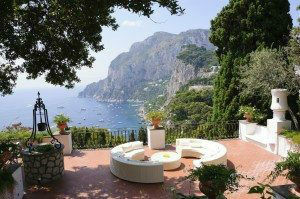 The extraordinary beauty of Capri, with its charming landscape, and the views of Anacapri, makes this a terrific port. While Capri has Roman ruins and a monastery, the following places are also worth a visit if time permits: Certosa of San Giacomo (XIV century), Palazzo Cerio (XV century), and the Villa of San Michele in Anacapri, known for its’ marvelous garden. Capri. As you make your way along Via Camerelle, in the 100 meters which separate the Grand Hotel Quisisana from Via Tragara, you’ll come across every one of the biggest names in fashion. If you’d rather buy something which has been island made, there are plenty of little artisan shops. Perhaps you would like a pair of handmade sandals. Have your feet measured in a sandal shop and choose your strap style and in one hour your custommade sandals will be ready. Jackie Kennedy was said to have once had her favorite shop open exclusively for her and spent the whole night trying out the various models. Artisan made perfume for your very own scent is also available on Capri. Whatever you choose to do, there is plenty to do and see on the sunny island of Capri. 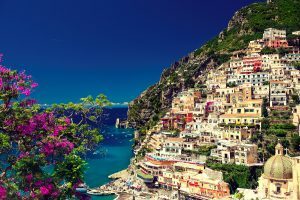 Day 6-7: Depart early AM for a 20-mile cruise to Amalfi, one of Italy’smost romantic villages, which clings to the dramatic slopes of the ruggedly beautiful Amalfi Coast. 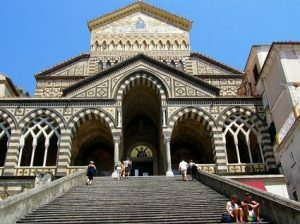 Visit Amalfi town and the very famous Cathedral and crypt. Take a taxi up into the hills behind Amalfi and have lunch in Ravello village, with its spectacular views of the coast and magnificent villas. Ravello sits on a rocky spur astride the Dragon’s and Reginna’s Valleys. 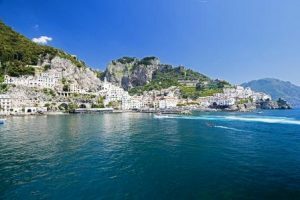 It is situated in a more elevated position than the other pearls of the Amalfi Coast and boasts exceptional views offering real photo opportunities. 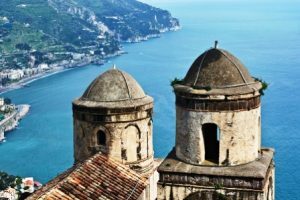 The writer Andre Gide insists “Ravello is nearer to the sky than it is to the shore” and the beauty of this small, village and the surrounds has attracted many famous people over the centuries. The first one to be astonished by such beauty was the writer Giovanni Boccaccio who quotes it in his Decameron. 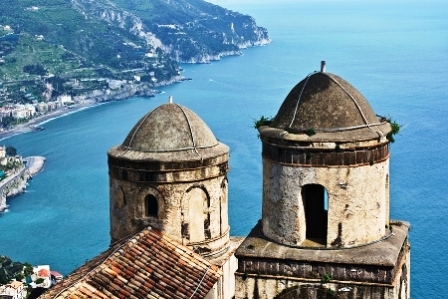 That was in 1350 and since then countless other artists, writers and celebrities have been enchanted by Ravello. 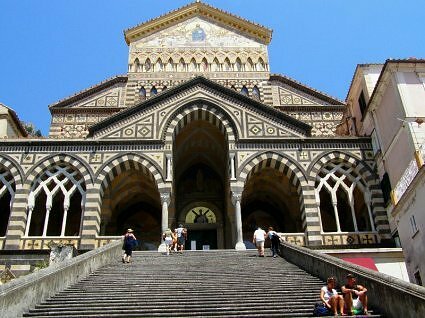 Sites to visit include the cathedral of St Pantaleone, Villa Rufolo and Villa Cimbrone. Hike down the steep trail of steps from Ravelo to Amalfi to rejoin your yacht or take a taxi back down the mountain to the coast. After visiting Ravello, cruise to Positano, which is built around a small curving bay on a steep hill overlooking the island of the Sirens. Once a sleepy fishing village, Positano is one of the most picturesque towns on the Amalfi coast. The typical Moorish style houses are lined up along the slopes facing the sea. Steep steps, narrow lanes, courtyards and gardens furnish the rest of the town. Enjoy this area and wander the many little shopping alleyways. At about 10:00pm, leave for the overnight cruise to Lipari in the Aeolian Islands, just off the northeast corner of Sicily. This little beautiful archipelago of islands, volcanic in origin, has no airport and can only be visited by boat, making the Aeolian Islands truly “off the beaten track”, and only visited by those in the know. 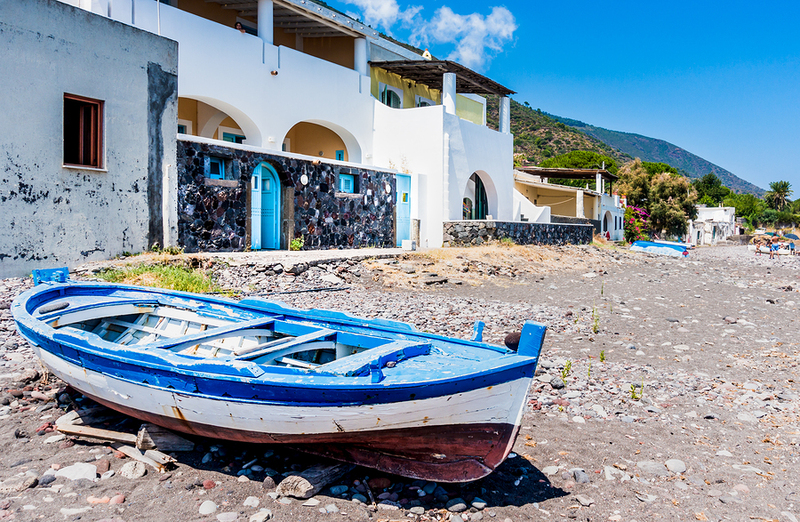 The Aeolian Islands are a UNESCO World Heritage Site, where any changes are strictly controlled so that the spirit of these islands remain as they were in yesteryear surrounded by crystal clear beautiful blue green waters. These are islands where fresh fish abounds, and local dishes are filled with locally harvested capers. Day 8: Leave early in the morning from the Amalfi Coast to cruise to Stromboli in the Aeolian Islands, the northernmost island of the archipelago and the most spectacular due to its continuously active volcano, dubbed ‘the lighthouse of the Mediterranean’ from ancient times to the present. To hike up the volcano for a view from the “Sciara del Fuoco”, allow three hours for the climb up and two for the descent. For sustenance on the hike, pick up some local pizza cooked by the natural heat of the volcano. 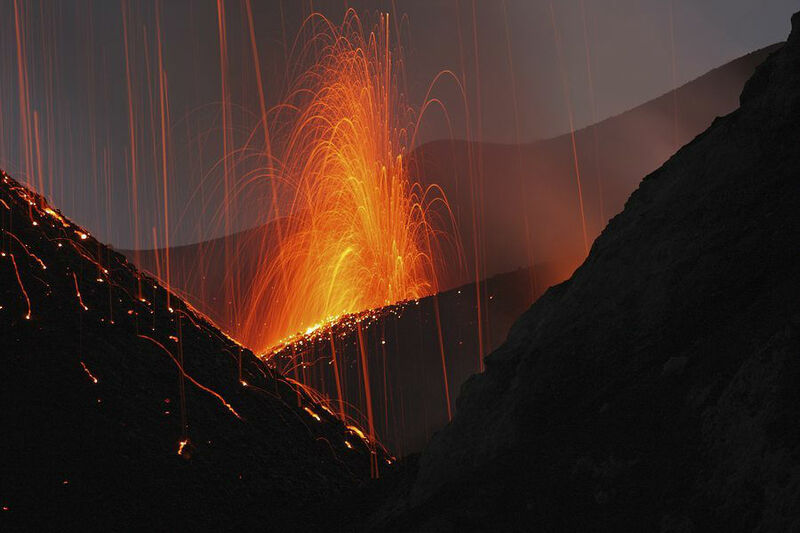 Stromboli is also a great place for experienced divers but not recommended for beginners. Return to the yacht for to cruise to the quiet island of Salina to overnight. this lazy island life. Lipari is the largest island and offers a wide selection of shops and restaurants. Visit the excellent Aeolian Museum, which exhibits archaeological exhibits from prehistory to Norman times, for in Ancient Times, this little island group was more heavily populated than today. Explore the Castello including the little museum. Throughout the town and island, you will stumble across remains of many other civilizations that once made Lipari their home. Later, for those on the go, hike to the top of Mount Sant’Angelo for a breathtaking view. Return to the yacht to move to another anchorage for a late swim and cocktails on the aft deck. Overnight. 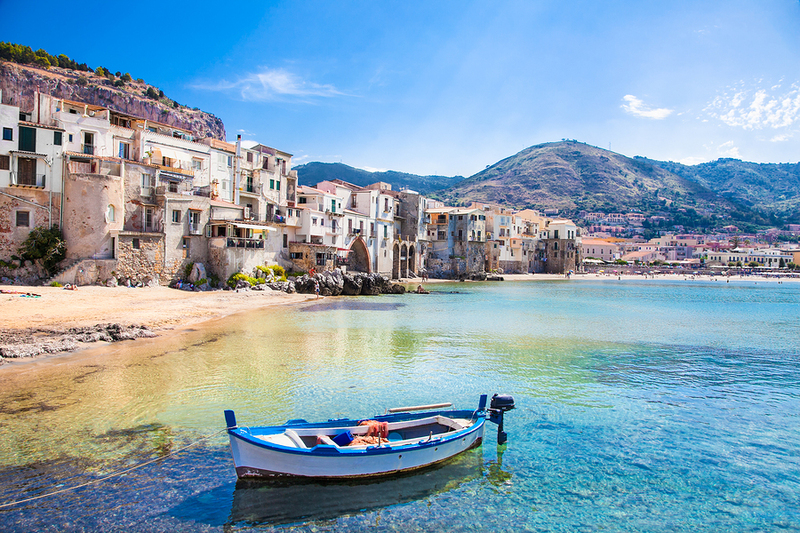 Day 10: Cruise early from Lipari and the Aeolian Islands to the picturesque port of Cefalu on the large nearby island of Sicily. Enjoy breakfast anchored in this harbor town, considered by many to be on the top 10 list of the most attractive harbors in Italy. This port town that first flourished during Greek and Roman times, has a significant cathedral from the Norman period with gold mosaic work on the ceiling. 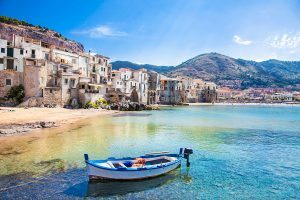 After breakfast explore this little harbor town, and then board a private luxury van with private guide and head off inland, for much of what there is to see and do in Sicily is in the interior of the island. It is your choice, depending on what might be of interest. 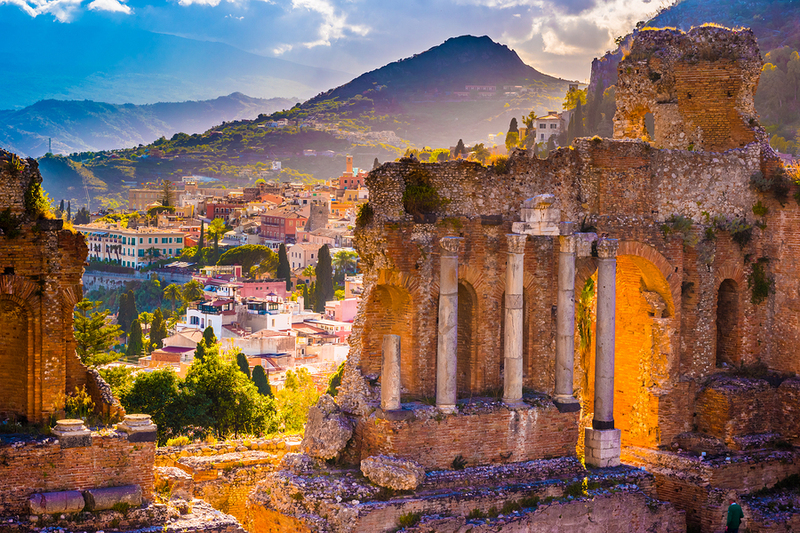 Perhaps enjoy a visit to Mount Etna, or while a distance, perhaps visit he Valley of the Temples for those into ancient history, or a tour of the Baroque southeastern side of the island including the towns of Noto and Syracuse. Meanwhile, your yacht will cruise to Taormina, to be waiting for you to reboard. Overnight. Day 11: Disembark for a transfer to the Catania Airport for an international flight home.